Easy to use one step peel and stick process makes roof repairs a snap. Works on all surfaces - rubber, polyethylene, polypropylene, fiberglass, wood, steel and aluminum. Maximum flexibility, durability and UV protection. It applies easily over old roof seams and roof coatings. Will never crack, peel, harden, ooze, or lose its grip. 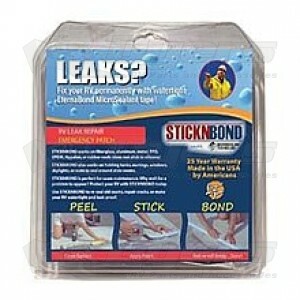 I purchased the EternaBond to fix several cracks in my RV bathtub. Works perfect to seal the cracks from leaks. Not the picture perfect look for patching but does what it was intended to do...stop the leaks! I have an older RV and didn't want to invest the $200+ to invest in a new bathtub so bought EternaBond and I have to say that the stuff works. I also had a crack in my radiator reservoir that I patched with EternaBond and it held for quite a while until the RV overheated and the reservoir filled with extremely hot water...under normal use it would work. Used the leftover 3" piece to patch a small crack in my grey water holding tank...so far so good. Would definitely recommend this product to patch almost anything where you don't care about the look verses stopping the leak.